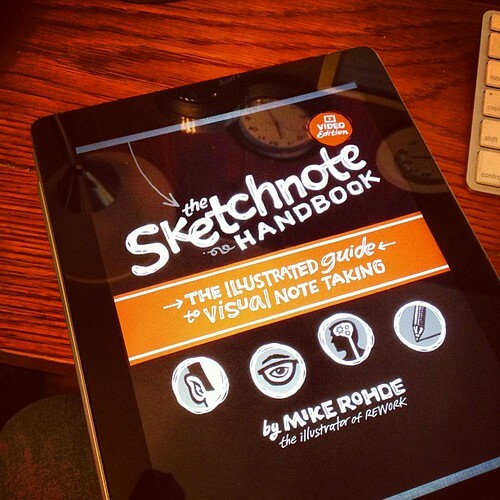 The Sketchnote Handbook: Update 10 - Delivery! IT'S DELIVERED! 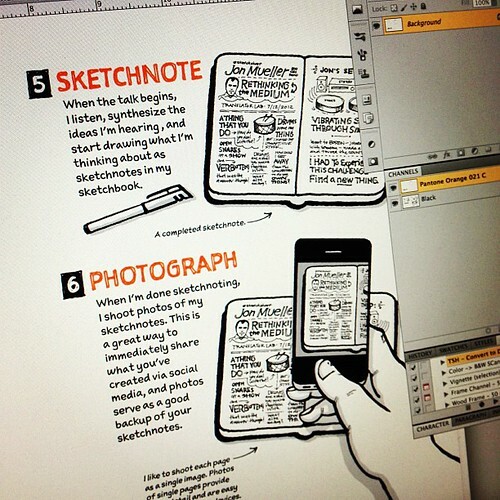 The Sketchnote Handbook is off to the publisher. Whew! Reviewing the final PDF files on my iPad. I'm near the end of The Sketchnote Handbook project, with the covers, 224 interior pages, master videos and video packaging files sent to Peachpit for final print production. Now my focus turns to preparing for launch and promotion of the book and video. It's oddly surreal to be done with all of the writing, illustration, design and production tasks. Something massive took over my life for many months and I think I've adapted to the flow of pushing to get it done so well, that with it complete, there's a bit of a vacuum. 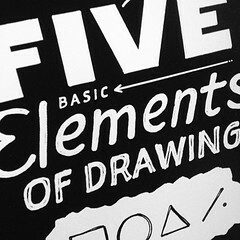 Snapshots of artwork during production. I have to tell you, the last month and a half has been a crazy, sleep-deprived marathon of pushing and clawing to complete the book. Days and days of nearly continuous work from morning until late at night, with breaks for eating and sleeping. Many of those nights I had no idea how I would pull it all off. They best advice given to me during this project was from one of my advisors, Stefan Bucher, He told me the key to writing a book is to make progress every single day. Many nights I would drag myself to bed, feeling drained, only knowing that I'd made some progress. That was enough to keep me going. In September, some of the pressure was not knowing when our baby would arrive. Looking back, I think Landon's arrival on September 19th was probably ideal. It forced me to let go of the project and take a little break, though even on days at the hospital, I was always making progress. And once he did arrive, that unknown situation was lifted, so I could focus on the book and finish strong. Producing the final pages of the book in Photoshop. 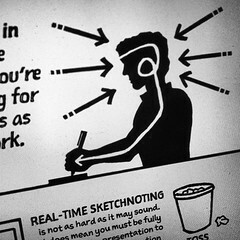 I've come to realize that writing, illustrating, designing and producing print-ready artwork for The Sketchnote Handbook, along with the shooting and producing The Sketchnote Handbook Video has been the single hardest project I've ever done, hands down. I've done my share of huge projects — they don't even compare to the hundreds of hours poured into this book and video. Had I known what I was in store for when I accepted this project, I might have declined it. However, all of the projects I've been most proud of have followed a similar pattern. In some way, not knowing the pain and challenges when I begin is how I trick myself into the big, daunting projects I end up being most proud of. There were many times I wanted to take the easy way out, but chose the harder way. For me, this is a life's work project. I hope you'll sense my love and dedication when you read the book and see the video. With all of the final files off for production, it's time to prepare for the book launch, review the final galley proof (a mocked up book to show how the book will look when final) and promote the book ahead of release. I'm also resting up a bit, taking my wife out for some dates to compensate for the months of work at night, spending time with my kids and just getting restored mentally. Writing also impacted my eating and exercise routines, which I need to get on track again. So, normal life, more or less. I already have some promotional ideas in the works — once I have those finalized I will share them here. One of my tasks is to update the book page with more samples, blurbs and other info — look for that soon. In fact, here's an interview just posted by Collaborate Meetings Magazine, about how I came to sketchnoting and some insights about the book. I'm also open to other ideas if you have them. I'd love to setup interviews for websites, or appear on podcasts to talk about the book, either before or after launch. If you'd like to propose something, get in touch. I'm starting to think ahead on how to handle the book tour, which is challenging with a new little baby in the mix. I can't take a week-long trip around the country. That would be tough on my wife and my day job. However, I'm imagining local single-day tours, starting in the midwest and maybe expanding as the book is out there, gaining readers and fans. If your company or organization would be interested in a possible tour stop when the book is released, I'd love to hear your ideas. drop a line and let's talk. I want to take a moment to say thanks to everyone who has encouraged me as I've fought my way through this project. Emails, tweets and kind words really have supported me through this project and I hope to make you all very proud and pleased with this book and video. Great news Mike. I can't wait to get my hands on it. I've enjoyed following your progress on the book through this blog and your tweets. Congratulations on finishing the book. I just pre-ordered it through Amazon in the UK. I can't wait! Very nice! Will you be offering it in some type of e-book format? Great update. I've pre-ordered, but am confused about the book/video packaging. If I order the book/video combo is the video the same as is on the separate DVD? Amazon info says the book/video provides access to 90+ how-to's. Is the DVD the same 90+ how-to's? Thanks. I want to get the full package. Fantastic news Mike. Thank you for taking us with you on this amazing adventure. All of the best with the launch and all the promotional hard work. I really don't know how you do it with a new little one in the mix as well. @mark - thanks for the pre-order, I appreciate it! @HC - there will be a PDF version offered at Peachpit's site I believe. Looks good on the iPad too. @Veda - good question. The video is the same in both cases, which is why I personally suggest the video edition of the book with both included. The book version has a code in the back for the video, while the DVD is physical media, but both videos are the same material. @Wayne - thanks! It's been pretty crazy with a new baby in the mix. I just had to take it one day at a time. i am very anxious to hold the final result. Congrats Mike! Can't wait to see it! @MikeRodhe- thanks for video packaging feedback. Looking forward to the results of your hard work, and working hard to learn the skills you share. I just want to let you know that I'm one of the many who have been looking forward to your book's publication since you first blogged about it. You and Peachpit make a formidable combination; your book is certain to enjoy long and lasting success.